How Much Hay is Wasted? Have you ever had the job of feeding hay to a barn full of horses? 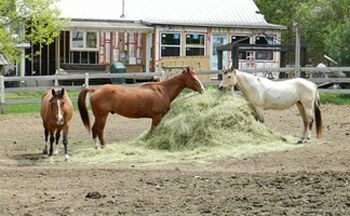 A common method of feeding hay to horses is to simply toss flakes of hay on the ground. The horses lower their heads and don’t stop eating until it’s all gone—or trampled into the ground. If you’ve ever mucked out a stall or seen a well-used paddock you know—there’s a lot of wasted hay when its fed on the ground. Horse Talk – flake: A flake of hay is a section of a square bale (the way it just naturally divides as in the photo above). Up until recently, no research had been done to find out how much hay is wasted when small square-bales are fed in outdoor paddocks. Kr­is­hona and her fellow researchers at the University of Minnesota wanted to find out. 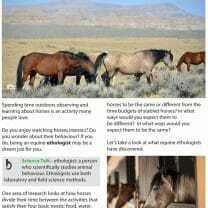 They designed a study to determine how much hay is wasted, herd bodyweight change, how much hay is eaten, and whether using small square-bale feeders for the outdoor feeding of adult horses is worth the money. Three feeder designs were chosen for the study. A no-feeder control (hay fed on the ground) was also evaluated. 1. 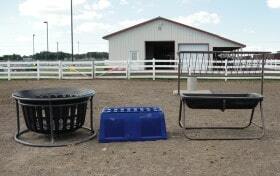 What was the range in price, from the least expensive to the most expensive hay feeder? 2. How much do these feeders cost altogether? 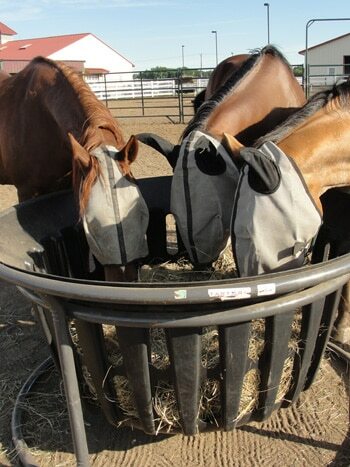 Three of the test horses eating hay from the basket feeder. Two feeders of each type were placed in separate, outdoor, dirt paddocks. Twelve adult horses were divided into four similar herds with an equal number of horses in each herd. The herds were rotated through the four paddocks (one had no feeder). They remained in each paddock for a period of seven days. 3. 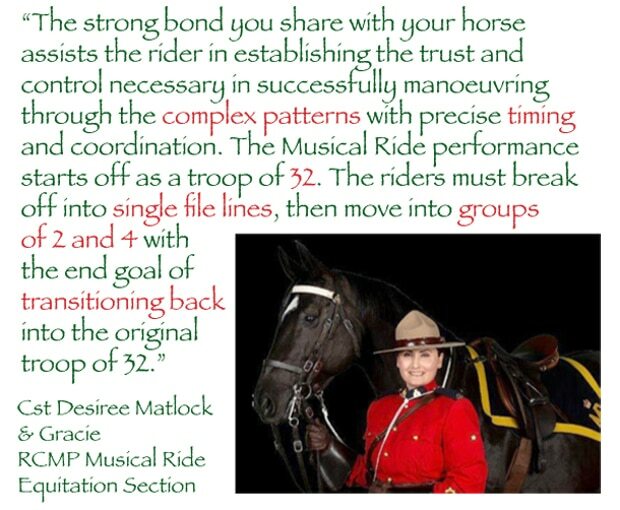 How many horses were in each herd? 4. How many days would it take for one complete rotation through all four paddocks? Horses were weighed using a scale before and after each rotation, and the weights added together to give the herd bodyweight. The difference between the before and after weights was called herd bodyweight change. Imagine you are one of the researchers. 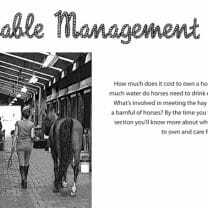 It is your job to weigh the horses in one herd, and calculate the herd bodyweight and the herd bodyweight change. 5. Calculate the herd bodyweight for this herd. 6. How would you calculate the herd bodyweight change? 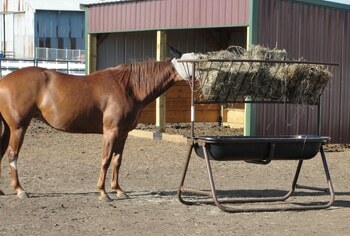 A test horse eats out of the hayrack feeder. For this experiment, grass hay was fed at 2.5% of the herd bodyweight split evenly between two feedings at 8:00 am and 4:00 pm. 7. How much time was there between the morning and afternoon feedings? 8. How much time was there between the afternoon feeding and the morning feeding the following day? 9. How much hay in total would you feed the herd you weighed? 10. How much hay will you feed at each feeding? Before each feeding, any hay left on the ground from the previous feeding, referred to as ‘Hay Waste,’ (HW), was cleaned up. Any hay left inside a feeder was also collected. This leftover hay was referred to as orts (O). Science Talk – orts: a scrap or remainder of food from a meal. The table to the left shows the researcher’s calculations based on what they observed and the data they collected. The percent hay waste (HW%) was calculated as the amount of hay waste (HW) divided by the amount of hay fed (HF) minus orts (O). Estimated hay intake (EHI) was estimated as the amount of hay fed (HF) minus orts (O) and hay waste (HW). 11. Write the calculation for percent hay waste as a math equation. 12. Write the calculation for percent estimated hay intake as a math equation. A large round bale fed on the ground. 13. Which feeding method resulted in the most hay being wasted? 14. Which feeder resulted the least amount of waste? 15. In which column do you find negative numbers? 16. What do these negative numbers tell you about the change in weight of the horses during that week? 17. Which feeding method resulted in the most weight gained over the test week? 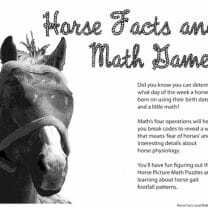 Understanding math and science is helpful when managing a stable. Now that you know how to reduce hay waste, if you managed a barn, which feeding method would you choose? Answer: $372 (the most expensive feeder) – $280 (the least expensive feeder) = $92. The feeders ranged in price by $92. Answer: $280 + $349 + $372 = $1001. Altogether the feeders cost $1001. Answer: 12 horses (total number of horses) ÷ 4 (the number of herds) = 3 horses. There were three horses in each herd. Answer: 4 (the number of paddocks) × 7 (the number of days in each paddock) = 28. A complete rotation between all four paddocks took 28 days. Imperial Answer: 1,050 lb + 1,160 lb + 1,110 lb = 3,320 lb. The herd bodyweight for this herd is 3,320 lb. Metric Answer: 476 kg + 526 kg + 504 kg = 1506 kg. The herd bodyweight for this herd is 1506 kg. Answer: You’ve got the herd bodyweight calculated when the horses enter a paddock. Seven days later, when the horses come out of the paddock, each horse is weighed again. Their three weights are added together. Now you’ve got the herd bodyweight when the horses entered the paddock, and seven days later, the herd bodyweight when the horses leave the paddock. Subtract the herd bodyweight upon leaving the paddock from the herd bodyweight when the horses first entered the paddock. The difference will be the change in the bodyweight of the herd for that 7-day period, the herd bodyweight change. Answer: 8:00 am to noon is 4 hours. Noon to 4 pm is another 4 hours. 4 hours + 4 hours = 8 hours. There were 8 hours between the morning and afternoon feedings. Answer 1: We already know the time between 8 am and 4 pm is 8 hours. We also know there are 24 hours in a day, therefore, the time between 4 pm and 8 am the next day is 24 (the total number of hours in a day) – 8 hours (the time between 8 am and 4 pm) = 16 hours. There are 16 hours between the last feeding of the day and the first feeding the next morning. Answer 2: 4 pm to 12 pm (midnight) is 8 hours. 12 pm to 8 am is also 8 hours. 8 hours + 8 hours = 16 hours. There are 16 hours between the last feeding of the day and the first feeding the next morning. Imperial Answer: 3,320 lb × 2.5% = 3,320 lb × .025 = 83 lb. 83 pounds of hay was fed to this herd each day. Metric Answer: 1506 kg × 2.5% = 1506 kg × .025 = 37.65 kg. 37.65 kilograms of hay was fed to this herd each day. Imperial Answer: 83 lb ÷ 2 = 41.5 lb. 41.5 pounds of hay was fed at each feeding. Metric Answer: 37.65 kg ÷ 2 = 18.825 kg. 18.3 kilograms of hay was fed to this herd each feeding. Answer: HW% = HW ÷ (HF − O). Answer: EHI = HF − (O + HW). Answer: Hay fed on the ground without using a feeder at all resulted in the most waste. Answer: The slat feeder resulted in the least amount of waste. Answer: The Herd Bodyweight Change column shows, – 7 lb and, – 24 lb. These are both negative numbers. Answer: The negative numbers mean the horses lost weight during the test period. Answer: The Herd Bodyweight Change for the basket feeder was the highest at 22 pounds. 3.NBT.A.2 – 3.NBT.A.2 Fluently add and subtract within 1000 using strategies and algorithms based on place value, properties of operations, and/or the relationship between addition and subtraction. 4.OA.A – Use the four operations with whole numbers to solve problems. 6.NS.B.3 – Fluently add, subtract, multiply, and divide multi-digit decimals using the standard algorithm for each operation. It’s Time to Bring in the Hay! We really enjoyed doing this post of the week since we have horses we keep and feed hay outside to. As of now, we don’t use any feeders. So it was interesting to find out how much hay is going to waste. My daughter’s question though is: if the slat feeder had the least amount of hay waste, why did the herd still loose 7 pounds? It logically does not make sense. Thanks for this great question! I’m going to contact the researchers and see if they can provide an explanation. If they do—I’ll be sure to post their response and let you know. That is exactly the kind of question a scientist would ask—then develop an experiment to try and determine the answer! One of the researchers, Krishona Martinson, was kind enough to respond to Esther’s question! Thanks for the info. 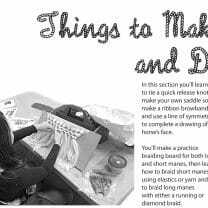 I’ve been looking for a several sites that could help me on some guidelines. Now I found it in your blog. Thanks for sharing!